Hello there! I hope you had a good weekend. I was busy finishing up some last minute gifts for my girlfriends. I altered a silver plated spoon and two small tins for a gift exchange. The Victorian Santa graphics came from Karen at The Graphics Fairy. I'm sure most of you know that her blog is a great source for FREE images. I'm going to link this project up to her Brag Monday party. It is a great party to visit and see all the projects that other bloggers have made using her freebies. The tart tins were altered into ornaments. The first thing to do is to make two small nail holes in your top. I do these right in the middle so the ornament will hang properly. I then used a thin gauge wire to create a loop and added some wooden beads and pearls. For the inside, I simply layered some cheesecloth, lace and the image then adhered to the bottom. The image was covered in a gel medium. I then painted some Tacky Glue around the edges and dipped in glass glitter. The silver spoon is my favorite. I love how ornate the serving spoon is all by itself. It's beautiful. I did not convert the spoon in to an ornament. I knew my girlfriend would want to display it with one of her many, many vignettes around the kitchen and dining room or frame it. We've talked about altering or framing silver for this purpose in the past. So, it was fun to surprise her with this little piece. 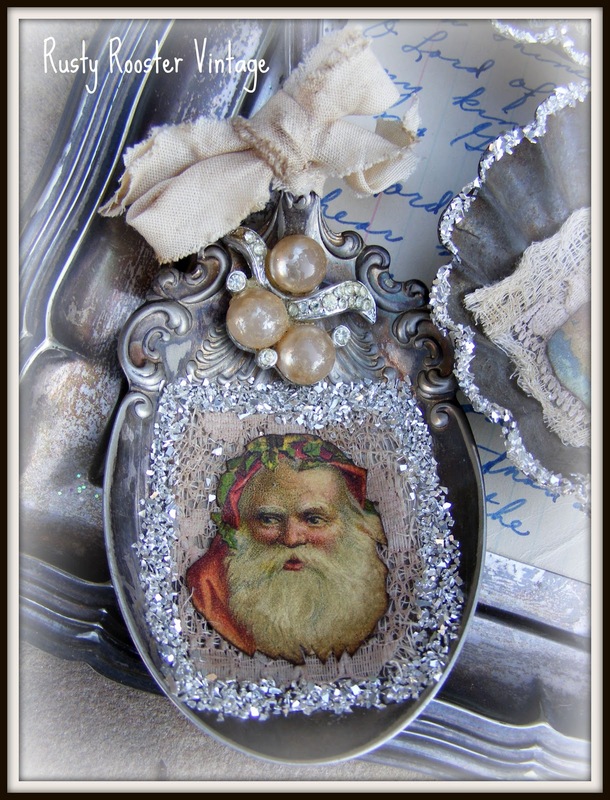 I added some crinkled ribbon and a vintage earring to the spoon along with the same layers of cheesecloth, lace and image. I made a frame this time out of the glass glitter. I hope you enjoyed my little project. The best part is the serving spoon was .50 at a local antique store and look how it has been repurposed! The tins were also .50 and from my trip to Renningers last month. Have a great week! I have a few more projects to share with you. I've been playing with paper clay. More on that soon! 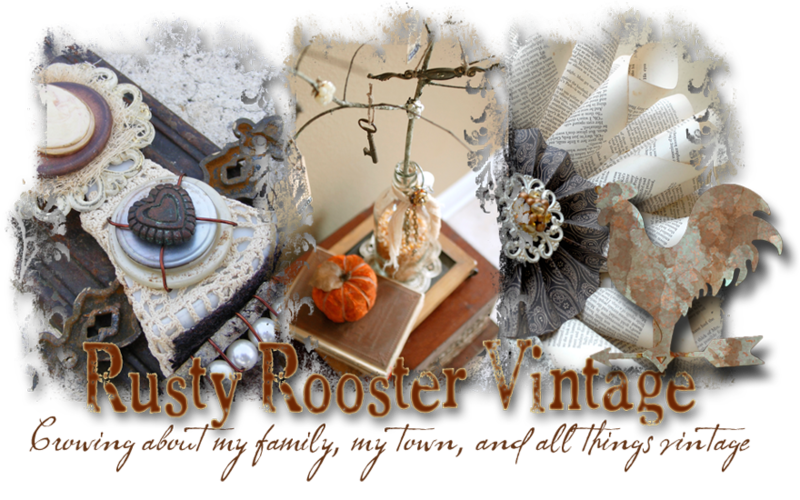 Also linking to Between Naps on the Porch Vintage Inspiration Friday and Nifty Thrifty Tuesday! Stop by and see us! Good windy cold morning to you! I love these projects and the spoon is my favorite. I will be in Oviedo on Wednesday for some junking with my buddy. Vicki, These are fabulous!!!! So simple, so clever and a great idea for using those little tins we all seem to find here and there. But the spoon is the piece de resistance! The spoon is so pretty! Great job of re-purposing with both spoon and tins. These turned out stunning! I love all the different materials you used, especially the pearls! Seriously creative Vicki! I just love that spoon!! I am going to be a crazy woman checking all the thrifts for spoons-Thanks for sharing! Love the altered spoon and tins! 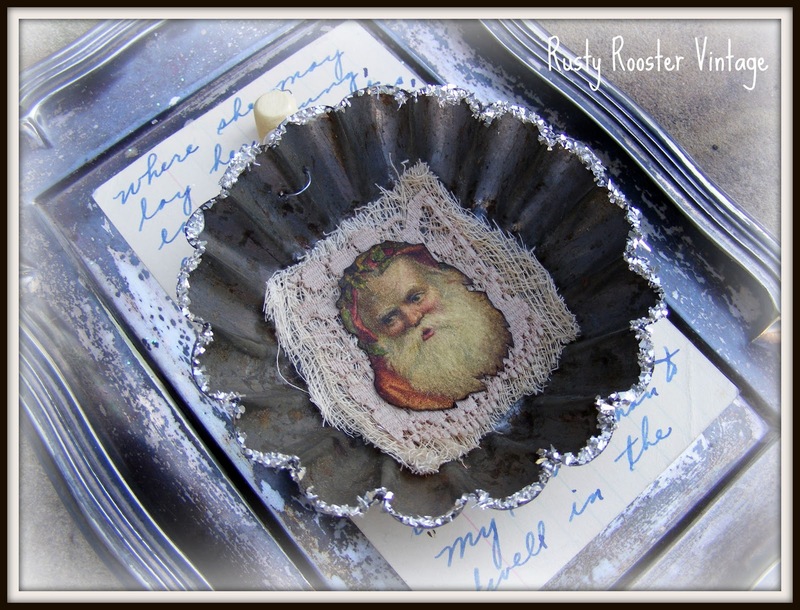 Wonderful repurposing project and such perfect little gift ideas! These are Wonderful! Love the Altered Spoon! You are Very Creative and do Beautiful Work! I love love love the spoon .!!! 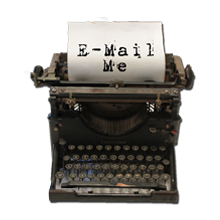 We're having a Free Giveaway through Wednesday at our blog ...if you would like to sign up for it stop in.. 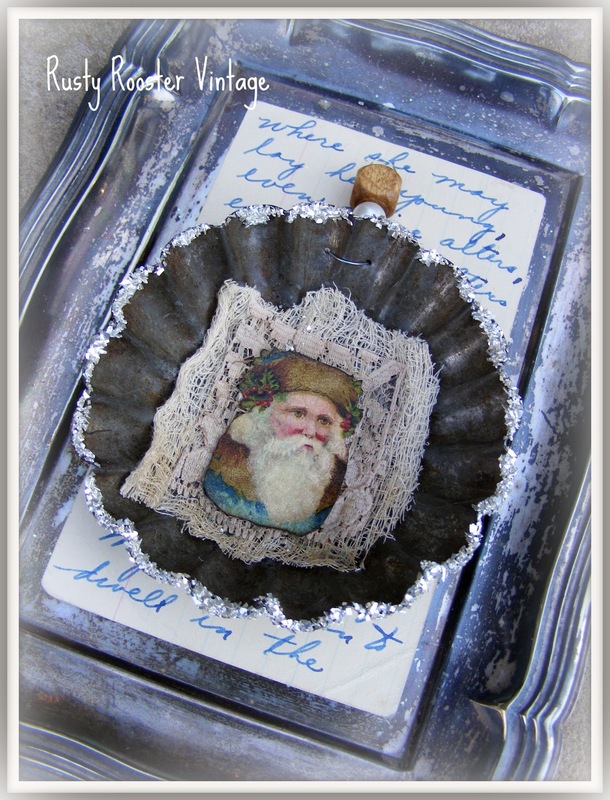 These are beautiful...wonderful ideas...and I have some spoons and old tins! 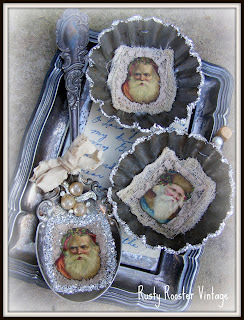 So gorgeous, Vicki, and these are my favorite Santa images too!!! Your projects are fantastic!!! I love the spoon !! I have a ton of silver spoons that I've collected...I've used them for stamping but now I think I'll try to alter some...great idea! Thanksa gain for sharing all your great ideas! Great ideas for repurposing. That spoon is darling! I love your idea! and the spoon and tart pans are perfect for displaying the images, I'm off to find some serving spoons! Those look great. You are so good at coming up with repurposing old items. Wow Vicki, these are just wonderful! Beautiful pieces. I really like how you re-purposed the spoon. It makes a lovely gift! Vicki your ornaments are alway so cute! 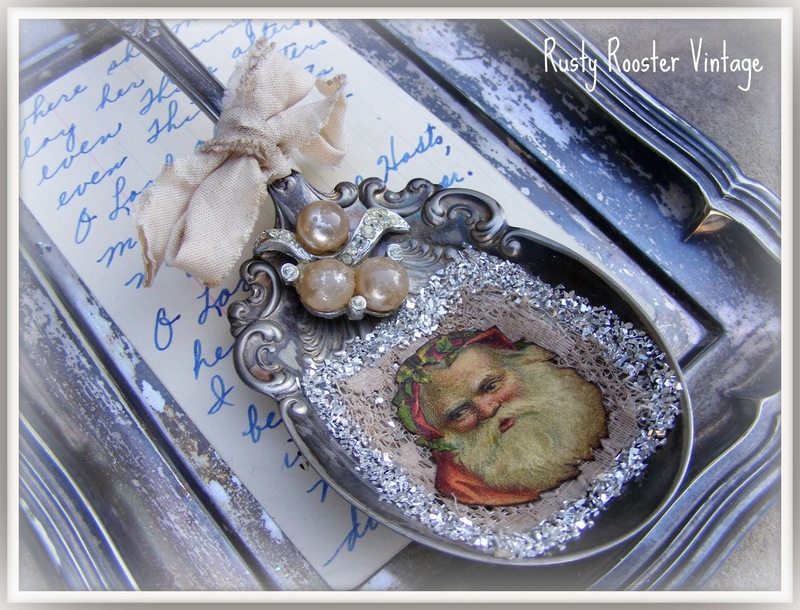 I love old silverware, now I have a great idea from you about what to do with it! What beautiful, unique treasures! I just love visiting you! Oh my gosh, these are gorgeous! I love any project that includes repurposing, so this is right up my alley. I am kicking myself, though, as I passed up a ton of cute little vintage jello molds this past summer at a thrift store for super cheap. They would have been perfect for this! Thanks for sharing such a great idea!! New to your blog - enjoying it! Love what you did with the spoons and tins! Their beautiful! LOVE your sparkly spoon! What a great idea. hmmmm. how could we do it into non-seasonal? I've got a box of spoons! Enjoy seeing all your projects. Coming over from Coastal Charm and so glad I did! I love what you did here - really unique and the end result is sooooo pretty! I think I'm in LOVE! I will have to try this with all of the tins I've collected over the years. Thanks for sharing. Vicki, that is fabulous!!! I can't get over that spoon, so in love with that piece! Love this project & think I'm going to try & make some for me!! Thanks for sharing friend! I love Karen's site...I will check it out! I believe I'm in spoon LOVEEEEEEEEE. Oh Gosh, these are just gorgeous!! The bling on the spoon is soooo yummy! love'em! Vicki, love your ideas and I love the spoon! Thanks for sharing and inspiring us all. I've never worked with paper clay, so I'm anxious to see what you come up with. Love the spoon! She's going to love it! These are just beautiful! Great gift ideas. I love personal items like that and I know your friends will. I have an Iced-tea spoon that belonged to my Mother. Your spoon is just 'the thing' for it. So pretty, Vicki! 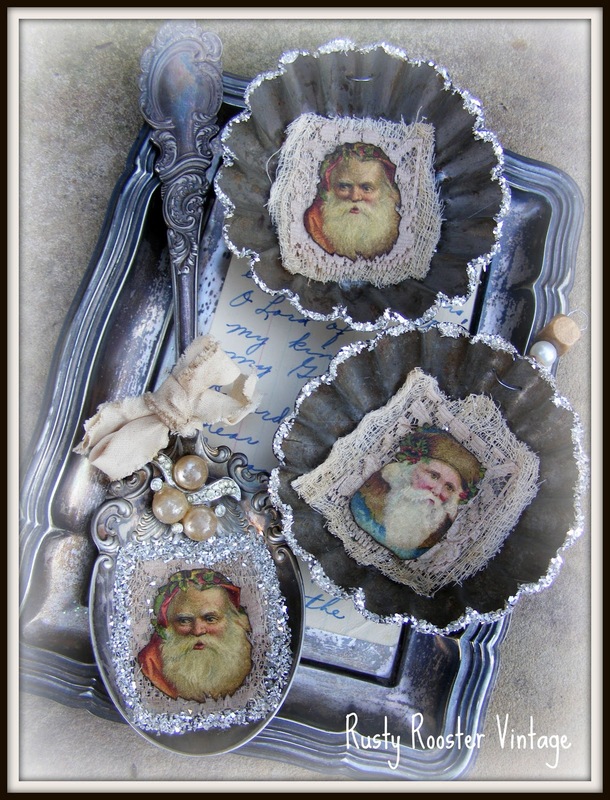 I just keep playing with these fun Santas, too! OMG Vicki, you are so very talented... I just love the altered spoon, it's just adorable!!! Vicky...I love this idea...I have worked with spoon jewelry before but never spoon ornaments. Very cute! I seriously love that Santa spoon, so cute! Have a wonderful Christmas! Those are adorable. I am partial to the spoon. Thanks for always sharing your creativity. Hi Vicki...these are so very beautiful! I love the spoon you made for your friend...the addition of the earring is the icing on the cake! These spoons are darling, I love them. And the tart is the cutest ornament. Hi Vicki! Visiting from Brag Monday. This spoon is gorgeous! What a great piece to use in altered art ~ the details on it really are perfect and called out for something like this. Just beautiful and I'm sure your friend is going to love it! hi vicki! 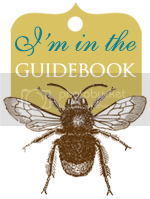 i just found your blog from the graphic fairy! and it was a nice surprise to see another florida girl! i love this idea! the spoon is my favorite too! its beautiful! your girlfriend will love it! i cant wait to look around! I LOVE the spoon! Oh what a great idea. Thanks for sharing! And the winner is....(insert drumroll please)!! !